Tasmanian law provides for integrated assessment of major projects by an independent, quasi-judicial statutory body, the Resource Planning and Development Commission (RPDC). A bilateral assessment agreement between Tasmania and the Commonwealth accredited this integrated assessment process for the purposes of the Environment Protection and Biodiversity Act 1999 (Cth) ['EPBC Act']. Gunns Limited proposes to construct and operate the world's fourth largest pulp mill at Bell Bay in Tasmania's Tamar Valley. 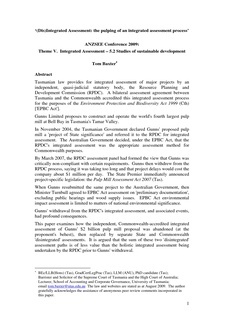 In November 2004, the Tasmanian Government declared Gunns' proposed pulp mill a 'project of State significance' and referred it to the RPDC for integrated assessment. The Australian Government decided, under the EPBC Act, that the RPDC's integrated assessment was the appropriate assessment method for Commonwealth purposes. By March 2007, the RPDC assessment panel had formed the view that Gunns was critically non-compliant with certain requirements. Gunns then withdrew from the RPDC process, saying it was taking too long and that project delays would cost the company about $1 million per day. The State Premier immediately announced project-specific legislation: the Pulp Mill Assessment Act 2007 (Tas). When Gunns resubmitted the same project to the Australian Government, then Minister Turnbull agreed to EPBC Act assessment on 'preliminary documentation', excluding public hearings and wood supply issues. EPBC Act environmental impact assessment is limited to matters of national environmental significance. Gunns' withdrawal from the RPDC's integrated assessment, and associated events, had profound consequences. This paper examines how the independent, Commonwealth-accredited integrated assessment of Gunns' $2 billion pulp mill proposal was abandoned (at the proponent's behest), then replaced by separate State and Commonwealth 'disintegrated' assessments. It is argued that the sum of these two 'disintegrated' assessment paths is of less value than the holistic integrated assessment being undertaken by the RPDC prior to Gunns' withdrawal.